Many anglers choose to fish for trout with light tackle. Colorado is home to hundreds of lakes populated with trout, though most anglers targeting trout choose to fish in Colorado's streams and rivers; 168 miles of Colorado streams have been designated by the Colorado Wildlife Commission as "gold medal" trout fishing water. Colorado trout include brown trout, rainbow trout, cutthroat trout and brook trout. 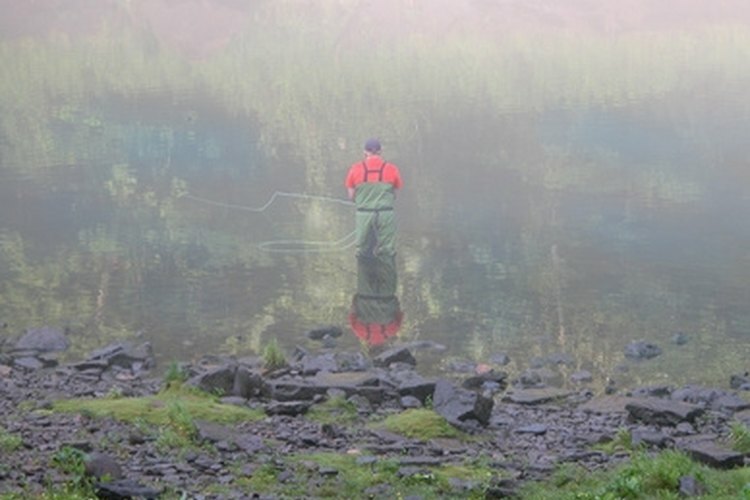 According to AllAboutFishing.com, brown trout are the hardest trout to catch in the state and brook trout are the easiest. Trout thrive on different sources of food in different bodies of water in Colorado, at particular times of year. Food sources include caddis, sculpins, mayflies, stoneflies, shrimp, crayfish, damsels, midges, terrestrials and other fish. Appropriate sub-surface fly patterns include caddis larvae, muddler/sculpin, bucktail, wooly buggers, damsel nymphs and pheasant tails. Useful surface flies include parachute adams, elkwing caddis and peackock caddis. Bread crust and mosquitoes can also be effective flies for catching trout. Effective baits for spin rods include minnows, worms and crustaceans. The best months to fish for trout in Colorado are May to October; look for them in the shallows of Colorado lakes in the spring and fall and in deeper waters during the summer months. According to AllAbou Fishing.com, Twin Lakes, Williams Fork Reservoir, Stagecoach Reservoir, Shadow Mountain Reservoir, Navajo Reservoir, Lake Granby, Carter Lake, Eleven Mile Reservoir, Adobe Creek Reservoir and Blue Mesa Reservoir are among the largest lakes in Colorado, and they all have a trout population. There are also more than a dozen streams that have been denoted "gold medal" spots to catch large trout by the Colorado Wildlife Commission.